Who knew that the folks living in Estonia make a wonderful liqueur (liköör)? 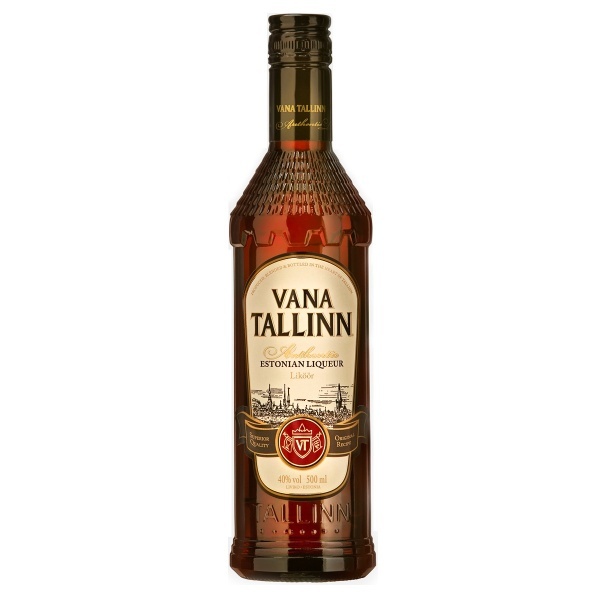 I sure as hell didn’t until a recent foray had me stumbling upon Vana Tallinn (or “Old Tallinn” in Estonian) in the amari/liqueur aisle. Because I am a true adventurer at heart, I had to pick up a bottle and give it a try. To my surprise, the spirit is actually quite fetching. Vana Tallinn is a dark, amber colored rum-based liqueur flavored with a secret blend of spices, including vanilla, cinnamon and citrus oils. The web site (www.vanatallinn.eu) unfurls like a game of Myst, filled with a mélange of marketing and folklore. Highly aromatic with honey and floral hints. 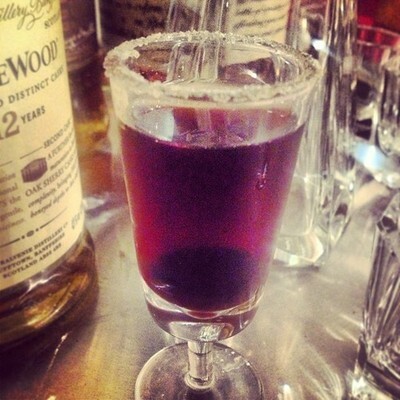 Full-bodied and velvety sweet, which artfully covers the alcoholic nature of the spirit. Long finish with butterscotch and anise. Really enjoyable as an after-dinner sipping treat. A very close friend asked if I would help create a special cocktail for her 25th college reunion… It needed to be somewhat thematic, or at least… green. 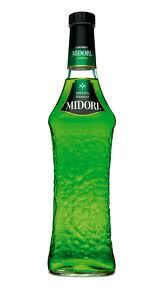 In the area of Green Chartreuse, I could find nothing that created a suitably green drink that was actually palatable. Most turned out a dull ocher or median rust color… far from the requisite green. Combine the ingredients in a shaker with crushed ice, shake vigorously to chill and strain into a cocktail glass. Garnish with an apple peel. Combine the ingredients in a shaker with crushed ice, shake vigorously to chill and strain into a cocktail glass. Garnish with a lemon or lime peel. Combine the ingredients in a shaker with crushed ice, shake vigorously to chill and strain into a cocktail glass. So, in the final analysis, we found three very good uses for a few spirits that have usually found their way to the way back of the bar… I can’t wait until St. Patty’s Day!! Rioja is arguably Spain’s most well-known wine region and may in fact be one of its oldest. Evidence of grape cultivation goes back to medieval times, with some historians claiming even earlier evidence of Phoenician and possibly even Greek wine making in the region. Powerful, yet refined nose with dark cherry, graphite and cedar hints. Full-bodied with moderate acidity and smooth, well-integrated tannin – well balanced. Dark fruit core with sour cherry, red current, cocoa dust saddle leather and tobacco notes. Long finish – smooth with vanilla and briarwood on the aftertaste. Drinking well and should improve nicely for another 5 to 7 years, easily. At an average bottle price of $29.99 before the discount, this wine is a very respectable value. “Shoulder” seasons demand “shoulder” cocktails and I am willing myself into spring, despite the unseasonably cold temperatures and generally inclement weather pattern these last few weeks. That said, nothing says “shoulder” cocktail better than spiced rum… Yes, typically rum is a summer/southern climes kind of spirit, but when combined with the correct ingredients it works in non-summery seasons. Combine with crushed ice in a shaker, mix and strain into a cocktail glass rimmed with honey, ginger and raw sugar – garnish with a Luxardo cherry. The south of France has many charms and the dark, red wines of the Côtes du Roussillon Villages are a real pleasure, especially in a great vintage like 2009. The larger area known collectively as the Languedoc-Roussillon is an expansive region stretching from about the city of Nimes in the east to the border of Spain. While thought of as one large region, the area is actually two distinct appellations: Languedoc in the north and Roussillon in the south. If one were to provide an overarching stereotype to the two regions, one might say that the Languedoc has more in common, stylistically with the southern Rhone region, while Roussillon shares more in common with southeastern Spanish regions. No matter, the wines that hail from either area are quite diverse, but all share a more rustic style – the reds especially are big, dark-complexioned with flavors that give an obvious nod to their surroundings. The smaller region of Côtes du Roussillon Villages is reserved for higher-quality red wines from the greater Roussillon region. Located in the hilly northern part of the Roussillon, the vineyards in the region have a long track record of producing a higher-tier of quality wines. The Côtes du Roussillon Villages does contain four named sub-regions: Caramany, Latour de France, Lesquerde and Tautavel, which may be listed on the label if the grapes originate from within their boundaries. If no designation is made, then the grapes hail from non-designated parcels. Soil types vary in the overall region, but the presence of the ubiquitous garrigue (low-lying scrub brush on limestone soils) imprints much of what is produced. The climate is resolutely Mediterranean in character – hot, dry with some moderating winds, which makes for a ripe, disease-free crop. Nicolas Batlle, an enthusiastic young winegrower, farms the lands of the Mas de Lavail with his family in the heart of the Maury appellation in the Rousillon region. This exceptional terroir consists of black shale and calcareous marl set between the Corbières and the Pyrenees at the foot of the Cathar castle, Quéribus. This location has a micro-climate which is favourable to noble grape varieties such as Grenache, Carignan and Syrah. The property’s wines are produced from old vines and are concentrated, generous and elegant. I also found the “technical” details of the wine – The vineyard comprises 8.04 hectares (19.54 acres) with an average vine age of 60 years. The soil type is listed as limestone-clay and the vineyard is noted as being “traditionally” managed. I assume that the term differentiates practices that would otherwise be considered “organic” or “biodynamic.” Grapes are harvested manually and are vinified, again, using “traditional” methods. A long maceration time is noted, which clearly is evidenced in the deep color of the wine. 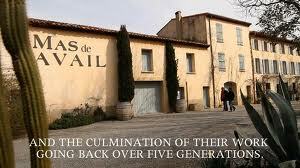 Total production is set at 30,000 bottles and it appears that the wines are aged for 12 months before bottling. The winemaker notes a 5 year aging potential, which I confirmed with my own tasting. Ripe, Jammy nose with explosive fruit – garrigue, pepper and floral hints. Full-bodied with moderate acidity and firm, dry tannin. Dark fruit core with black cherry, tar and spice notes. Moderate length with a layered finish – very nice. Drinking well now and should improve with another 3 to 5 years in the bottle. At an average bottle price of $16.99 before the discount, this wine is a very respectable value.